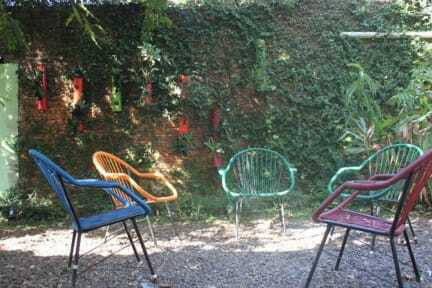 Hamaca Paraguaya Hostel was opened on 1 January 2012, creating a new concept of hostel in the city of Asuncion. The place has equipped kitchen so guests can prepare their own meals or store area with cable TV, a large yard with lots of green, barbecue grill, pool games and foosball, terrace, selling drinks and small bar which is usually opened when performing parties. Hamaca Paraguaya Hostel is located in a quiet and safe residential area, with supermarkets, restaurants and access to bus stops, a few blocks.No doubt Hamaca Paraguaya Hostel is the best choice in Asuncion, Paraguay! 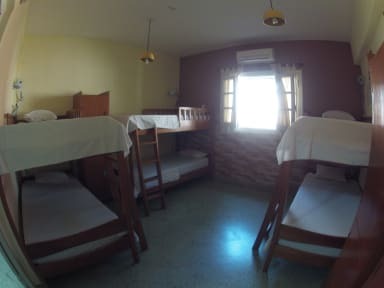 The Hostel offers dormitory rooms that can accommodate 2 to 10 people, all rooms have large beds, lamps in each, individual lockers and air conditioning, all bedrooms have shared with hot and easily accessible water bath. Extended my stay for some extra because I was having so much fun with the two guys who basically lives in this hostel and some other travellers. The hostel made me feel at home. People came and left without speaking but us who stayed longer had a great time. The staff and the inhabitants made everything so great. They even made us bbq and food the days I was here! Fine breakfast and great and helpful staff! Would recommend!! P.s. say hi to the crazy Australian for me - he's a legend! The best thing about the Hamaca hostel is the staff. Especially the woman who is there during the nights is amazingly friendly and very helpful. I really enjoyed my stay there. Breakfast was okay, there was something new every day. The common rooms were a little cold, since it is still winter, but the bedroom was comfortably warm. There were not a lot of guests but that made it feel homey. It is a little further away from the city centre but still walking distance. I'd stay there again. It was unclear that the upstairs longe was part of the hostel, we were told we could use it but that didn't seem to suit one of the 'owners' who ignored us & made us feel quite uncomfortable when we went to watch tv! Other staff were very nice.